Ultrafiltration occurs at the barrier between the blood and the filtrate in the renal capsule or Bowman's capsule in the kidneys. The Bowman's capsule contains a dense capillary network called the glomerulus. Blood flows into these capillaries through the afferent arteriole and leaves through the efferent arteriole. • the layer of cells making up the wall of the renal capsule, called podocytes; these cells have slits between them. 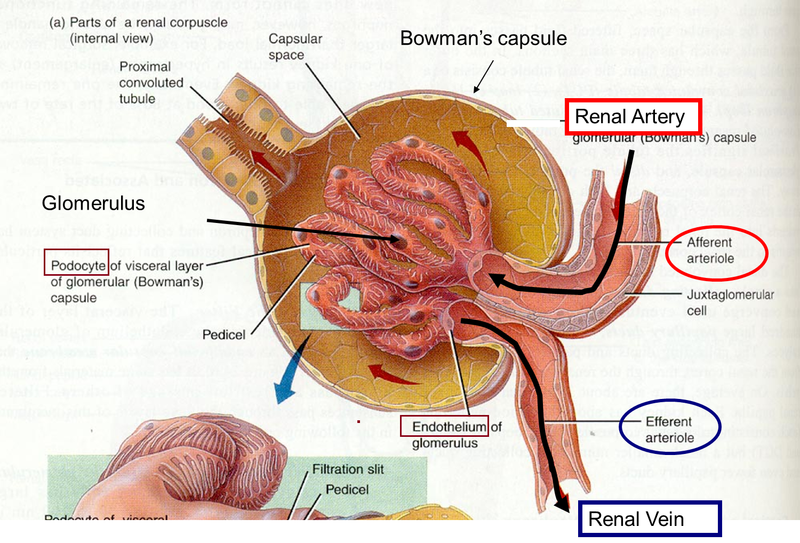 The blood in a glomerulus is at a relatively high pressure, because the efferent arteriole is narrower than the afferent arteriole. 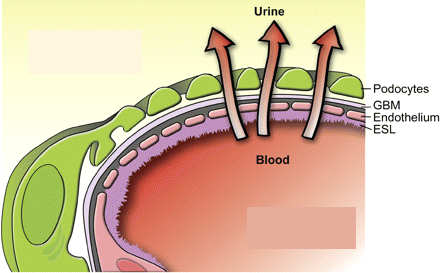 This forces molecules from the blood through these three structures, into the renal capsule. The pores in the capsulary endothelium and the slits between the podocytes will let all molecules through, but the basement membrane acts as a filter and will only let small molecules pass through. - Substances that can pass through include water, glucose, inorganic ions such as Na+, K+ and Cl- and urea. - Substances that cannot pass through include red and white blood cells and plasma proteins (such as albumen and fibrinogen). - The liquid that seeps through into the renal capsule is called glomerular filtrate. These substances are therefore taken back into the blood through the walls of the proximal convoluted tubule. This is called selective reabsorption. The cells in the walls of the tubule have many mitochondria, to provide ATP for active transport. Their surfaces facing the lumen of the tubule have a large surface area provided by microvilli. Active transport is used to move Na+ out of the outer surface of a cell in the wall of the proximal convoluted tubule, into the blood. As the Na+ions diffuse through these transporter proteins, they carry glucose molecules with them. This is called co-transport. The glucose molecules move through the cell and diffuse into the blood. 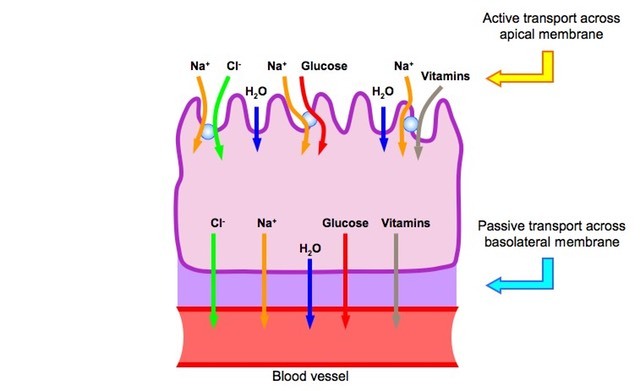 The movement of Na+ and glucose into the blood decreases the water potential in the blood. 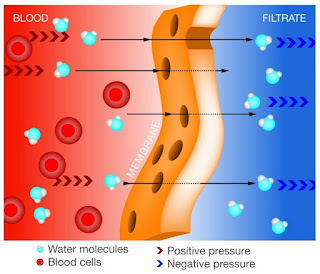 Water therefore moves by osmosis from the fluid inside the tubule, down a water potential gradient through the cells making up the wall of the tubule and into the blood. About 50% of the urea is also reabsorbed in the proximal convoluted tubule. 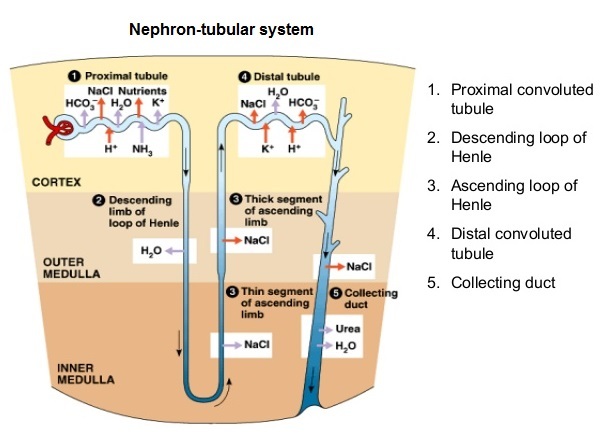 Some, but not all, nephrons have long loops of Henle that dip down into the medulla and then back up into the cortex. 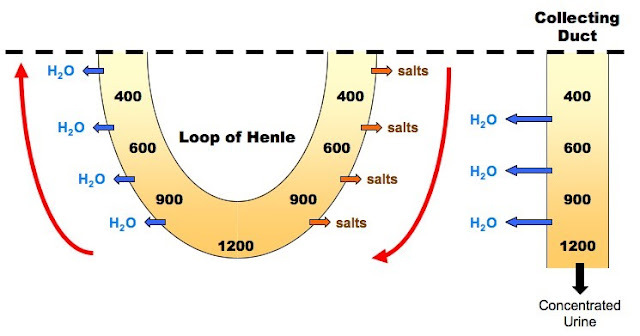 The function of the loop of Henle is to build up a high concentration of Na+ and CI- in the tissues of the medulla. This allows highly concentrated urine to be produced. Note that the loop of Henle itself does not produce highly concentrated urine. As fluid flows down the descending limb of the loop of Henle, water moves out of it by osmosis. By the time the fluid reaches the bottom of the loop, it has a much lower water potential than at the top of the loop. As it flows up the ascending limb, Na+ and Cl- move out of the fluid into the surrounding tissues, first by diffusion and then by active transport. This creates a low water potential in the tissues of the medulla. The longer the loop, the lower the water potential that can be produced. The descending limb of the loop of Henle is permeable to water, but relatively impermeable to Na+Cl-. As the vasa recta blood network that surrounds the loop flows in the opposite direction (counter-current exchange), this further multiplies the effect. 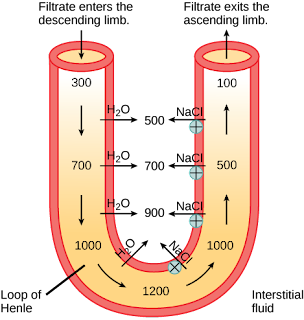 The fluid inside the tubule as it leaves the loop of Henle and moves into the collecting duct has lost a little more water and more Na+ than it had when it entered the loop. Because more water has been lost, the concentration of urea has increased. Now, in the distal convoluted tubule, Na+ is actively transported out of the fluid. The fluid then flows through the collecting duct. This passes through the medulla, where you have seen that a low water potential has been produced by the loop of Henle. As the fluid continues to flow through the collecting duct, water moves down the water potential gradient from the collecting duct and into the tissues of the medulla. This further increases the concentration of urea in the tubule. The fluid that finally leaves the collecting duct and flows into the ureter is urine. Homeostasis in mammals requires complex systems to maintain internal conditions near constant. The kidneys remove wastes from the blood and are the effectors for controlling the water potential of the blood. Stomatal aperture is regulated in response to the requirements for uptake of carbon dioxide for photosynthesis and conserving water. This article about Ultrafiltration and reabsorption is very informative I read it and enjoyed. Thanks for sharing such informative and please keep sharing more info.